DON’T be surprised if future models of Piaggio/Vespa scooters start looking like the BV 350 – on the inside, at least. She used to be called Beverly but here in Oz she’s just BV. The new design 330cc single cylinder engine has had a complete remake especially with the clutch. Of course, like most scooters, it still sports the twist and go set-up but there’s a dry sump in there and in a new twist, pardon the pun, there’s a wet clutch which is fully integrated with the gearbox. At the launch Piaggio’s Technical Manager John Hansen, who’s no slouch with a pool cue either, had a BV 350 engine apart for us so we could all get a good look at the internals. There are a few other interesting things too, like clutch plates that only fit together one way so that there’s no chance of a mix up. There are valve shims instead of screw adjusters so that it’s easier, and faster, to service when it comes time to check the valves. A new torque server is also claimed to improve engine braking characteristics. Piaggio has gone to a lot of effort to also reduce engine friction which results in better fuel economy and longer service intervals. Minor services are now every 10,000km and major services at a remarkable 40,000km – which includes checking the valve clearance. That’s a huge improvement on the previous Quasar engine. In fact, the new BV 350 engine is only 62cc bigger than its predecessor but with a lot more power output. Piaggio says it’s like a 400cc performance wise while weighing less which makes for a massive improvement in power-to-weight. So, what’s it go like? Well, you definitely do notice the impact of the work Piaggio has done. Weighing in at 177kg the 24.5kW pushes the BV 350 at a spirited pace and even at freeway speeds it’s not left short of breath. And even then it still had more left in the throttle. I liked the way it handles around the inner city and suburban back blocks. Our launch test ride covered a lot of different riding conditions. The extra oomph in the newly designed engine is noticeable and on the longer stretches out in the countryside I almost forgot I was riding a 350 at times. The water-cooled four-stroke, four-valve engine features a lot of high tech gear including ABS as standard as well as ASR traction control which also has a manual disable button. 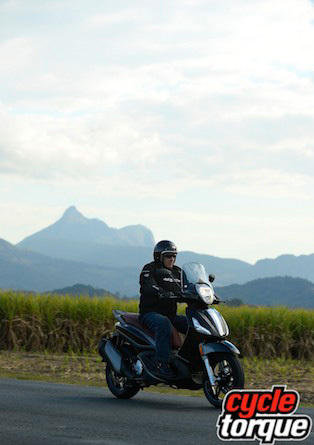 With a 16 inch front wheel and 14 inch rear the BV 350 makes for a very sure-footed and confidence inspiring ride. So too with the brakes. The front carried a 300mm disc with three-piston caliper while the rear sports a 240mm disc which more than comfortably do their job. Suspension works well with those big wheels to combine for smooth and positive behaviour, especially on some not so wonderful suburban roads. Front suspension is 35mm telescopic tunes and rear duties are handled by twin coiled shocks with dual effect dampening and adjustable preload. The large 13 litre fuel tank will make sure you can cover a lot of ground between fuel stops on this Piaggio. The fuel tank is easily accessed and finished with flush mount aircraft style lockable fuel cap. Likewise the stylish flush folding pillion pegs, very tidy! The seat height is only 795mm making it an easy reach for most riders. 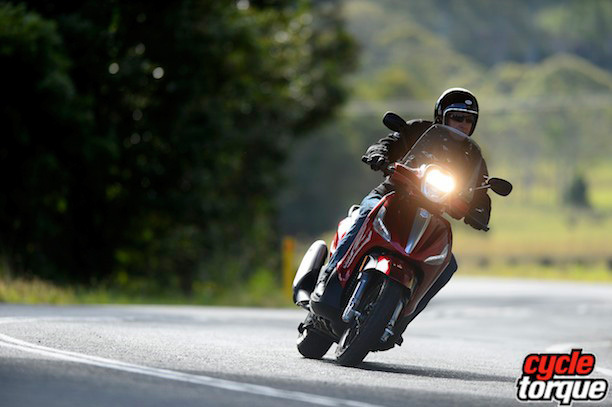 The rider’s seat is very comfortable with a step-up to the pillion which is equally spacious. There is also a passenger grab rail and the little rear rack means it’s top-box ready. Adding to the rider’s comfort is the handlebar mounted screen. It’s not huge but it is efficient. The other thing adding to this machine’s riding stability is its 1560mm wheelbase which is the longest in the Piaggio range, apart from the 1640mm of the new Piaggio X10 500 Executive maxi scooter. The sidestand has an engine lock-out switch for safety while parked which is being increasingly seen on more and more scooters these days, and there’s also a centrestand on this model. 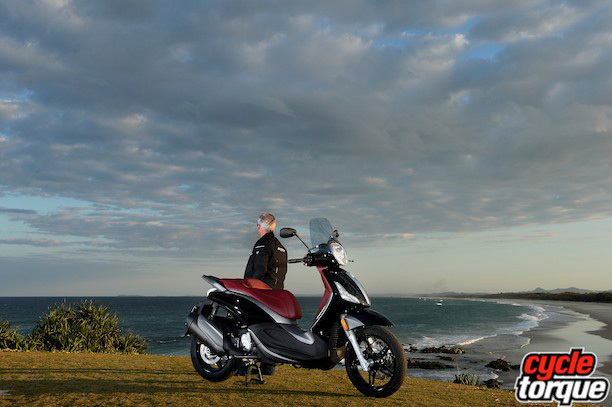 And in keeping with the quality that you expect from a marque like Piaggio are all those other neat things like anti-theft electronic key coded immobiliser, powerful halogen headlight and front mounted LED lighting, large lockable under-seat storage and smart glove compartment with 12volt auxiliary power plug socket and fold-away bag hook. Analogue speedo is easy to read and has the other things you expect like fuel and engine temperature gauges with digital odometer and clock. 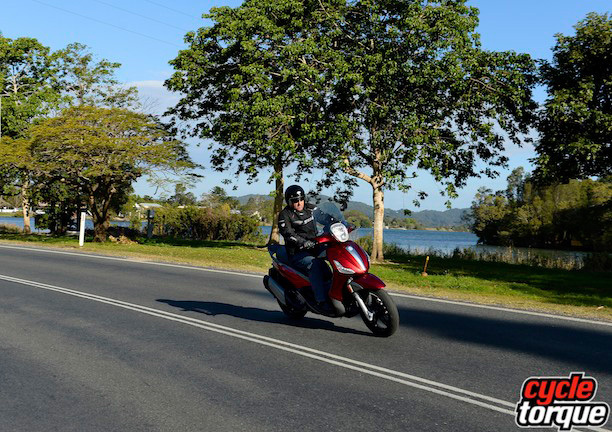 A nice performer with a quality build, the Piaggio BV 350 retails for $7990 and you’ll get the customary two year unlimited kilometre warranty.